The BOSEbuild Speaker Cube is now available at build.bose.com for $149. It’s intended for ages 8 and older – and for the kid in all of us. “We believe in the importance of STEM education,” says Joe Titlow, Head of Sales and Marketing for BOSEbuild. 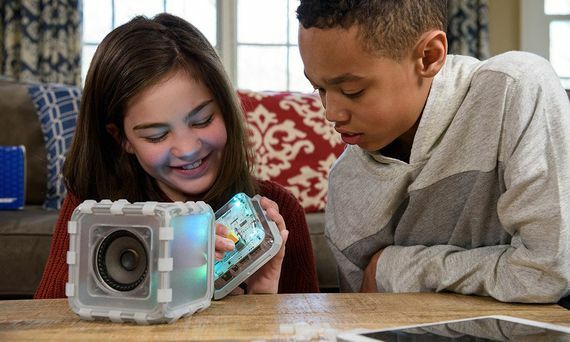 Believing that hands-on exploration is the key to sparking a child’s curiosity, Bose Corporation has officially launched BOSEbuild, the company’s new “build-it-yourself” category focused specifically on kids. BOSEbuild’s first product is the Speaker Cube, a complete kit that lets kids explore the science of sound by making a Bose® Bluetooth® speaker – and use their creativity to personalize it with colors and covers. The BOSEbuild Speaker Cube uses high-quality parts and materials for durability. It’s easy to build, too. Its instructions involve discovery and education – from how a simple magnet and coil make sound, to how a speaker reproduces music. The coaching is delivered through a free companion app that combines step-by-step guidance with hands-on interaction, confirming success along the way until the Speaker Cube is fully assembled. By adding colored lights and silhouette covers, every Speaker Cube can be uniquely customized by its builder. And like any Bose Bluetooth speaker, the Speaker Cube pairs to any smartphone or tablet, so kids can stream their favorite songs in an instant. When they are done, kids will enjoy amazing Bose sound for years to come. This entry was posted in Entertainment, Raising Tweens, Technology, Videos and tagged BOSEbuild, encouraging STEM, gifts for tweens, girls in STEM, speakers. Bookmark the permalink.